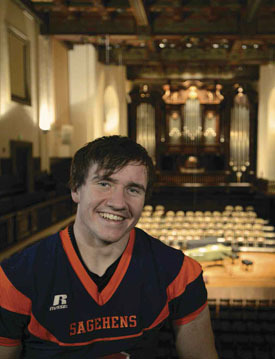 Matt O’Connor ’15 wanted two things out of college—rigorous academics and the opportunity to play football. As a starting linebacker and double major in theatre and the interdisciplinary field of philosophy, politics and economics, Matt says he found both at Pomona, along with something else he considers just as important: fellow students who are collaborative, open and involved. A native of Louisville, Colo., Matt also competes in the shot put and participates in musical theatre and the Pomona College Choir. He founded Claremont Christian Athletes and is active in Nourish International, a student-run nonprofit that works to fight global poverty.